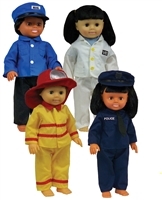 16" multicultural boy and girl dolls with poseable limbs and head and dress up outfits. 16" full vinyl body dolls have rooted hair and machine washable 'everyday' clothes. Poseable head and limbs and can stand upright. Set of 8 (dolls can also be purchased individually). Princess dresses for 16" dolls. Girl doll clothes for 16" dolls. Sports doll clothes for 16" dolls. Career doll clothes for 16" dolls.